During the season of Christmas we hear the truth that God came to dwell among us as an infant, completely dependent on human kindness. And now in the season of Easter we declare that this same child grew to proclaim the good news of the Kingdom of God and was wrongfully arrested and executed for it. But not only that, but after all seemed lost, after his shameful death and the scattering of his followers in confusion, Jesus was raised from the dead, triumphing over sin and death. But, if you were one of his disciples, in those days after his death, would you be ready to believe his resurrection was about to happen? Imagine you are Peter or Martha, and Mary Magdalene comes to you on that morning and tells you that she has seen Jesus and that he is not dead but alive. Suppose that while you are there, Jesus suddenly appears among you. And it is not a ghost or mass hallucination. Instead he is there and you see the marks on his body, the marks that showed how terribly he died. And then next Jesus breathes on you – literally giving the breath of God — the Holy Spirit. And then he tells you that if you forgive the sins of any, they are forgiven. This is the core of what Jesus has sought to teach his disciples – he has come to grant the peace of God, found especially in the forgiveness of sins. 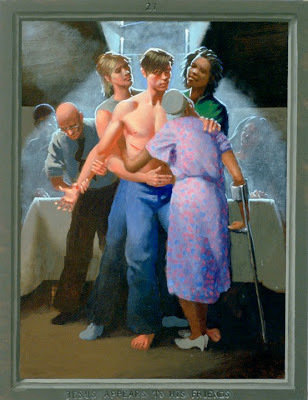 In that moment of receiving the Spirit, the disciples grasp who Jesus truly is. And they grasp who they are – apostles – apostle in the New Testament Greek meaning those sent to continue the mission of God in Christ on earth. But suppose you were not there at that pivotal moment. For whatever reason, you were not there when Jesus appeared to the others that Easter Day. And you wonder if all they said is really true. But then you, Thomas, receive a gift – Jesus appears to you and the other disciples a week later. And you see all that the disciples saw before. And you too fully grasp who Jesus was in that moment and you worship him as your Lord and God. I think John is telling us that in the act of recognizing who Jesus truly is; that act also makes Thomas an apostle, a sent one. We are all like Thomas in our own ways. We were not there when Jesus was raised from the dead. And yet every week we are called to proclaim this great mystery of the resurrection. Indeed Jesus says of people like us, “Blessed are those who have not seen and yet believe” (20:29). The Apostle Paul says that to the world, believing that someone was raised from the dead can seem like great foolishness. So why do we believe? For each one of us that believing has different beginning points. But I would venture that for most of us we believe because our hearts have been touched by someone who spoke the good news of Jesus to us. It could have been your mother or father, a friend, a teacher, a counselor, a pastor. I would argue then that the message of the good news of Jesus has come to us through apostles in our day, ones who have been sent to us in our lives. And to go one step further, the one who brought you to the gospel, that person had been brought there by other apostles who had proclaimed the gospel to them. Now, let us consider that if there are about 25 years in a generation then we could imagine a line of about 80 people between the ones who proclaimed Jesus to us and those first apostles who encountered the risen Jesus two thousand years ago. Imagine that line of 80 people extending from the pack of the church all the way up to the altar. Imagine the ones who have gone before you — the ones sent out to proclaim “what was from the beginning, what we have heard, what we have seen with our eyes, what we have looked at and touched with our hands” (I John 1:1). We are the ones now sent to proclaim the Good News of the Risen Christ. As you come up to this altar and as you sit in your pew while others receive communion, imagine us all flowing up to the altar seeking the risen Christ and meeting him there and returning again to our seat, sent from the altar as his apostles in the world. Christ is risen, let us go forth from here as his apostles, his pierced hands and pierced feet in this world. You don’t see Jesus get up and took off his robe. You are too busy trying to make sense of the table set before you. But there is no Passover meal set out on the table. There is no lamb — just some bread and other simple food. It is only after a few minutes that you look around. You notice Jesus is not with you. You turn your head from where you are reclining along the banquet table. You see him in the corner. There he is with his robe off and filling a bowl with some water. You watch him go over and start washing the feet of Andrew and then Philip. But you all had your feet washed already before you sat down to eat. The servant boy who had done it now is fumbling around, thinking he must have missed something. He rushes over to do his work again, but Jesus kindly turns him back. Simon Peter pulls his feet in when Jesus turns to him next. And then you realize this is not about your feet, dirty or clean. He is showing you that you have been made clean. Clean of everything — inside and out — but only if you let Jesus be this close to you, gently washing and wiping your feet. When he washes the feet of Judas, you see the tender look Jesus gives Judas as he looks deep into his eyes, while caressing his feet in those towels. And you see Judas turn his face away, unable to hold his gaze. 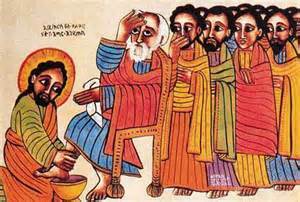 When Jesus finishes and takes his place back at the table, he tells all of you that you should wash the feet of one another. Just as he has for Andrew and Philip and Peter and Judas and you. Thinking back on it, you know that you could not have washed the feet of Judas. To do it would have meant forgiving him and loving him. But Jesus did wash the feet of Judas and when he did it, he loved him. The next day, after a terrible night, you will stand there at the cross. You again will see Jesus without his robe. But this time it will not be carefully folded on a stool. Now it is in a pile at the foot of a soldier. And again on that next day, you also see a washing bowl next to Jesus. But this time it will not be to wash your feet but so you that you can wash his body. And when you are done with that sad and silent work, you will turn and wash the feet of the one next to you. And it is then that you will know that Jesus truly has come from God. And that he has returned to God. And you will pick up the bowl and go back to the room where you have all gathered and you will wait.